Professor Philip Yecko was awarded a National Science Foundation (NSF) collaborative research grant on "Improved Vehicle Autonomy in Geophysical Flows" by the Dynamics, Controls and System Diagnostic program of the Control & System Diagnostics Program of the Division of Civil, Mechanical and Manufacturing Innovation. The grant funds research, in collaboration with Drexel & Montclair State Universities and the Woods Hole OceanographicInstitute (WHOI), on the optimal control of autonomous ocean vehicle networks (drones) in complex geophysical flows. Networks of autonomous underwater and surface vehicles (AUVs and ASVs) allow direct and continuous monitoring of the ocean. New deployment strategies are needed to obtain maximum coverage from a relatively small number of vessels. This will require better understanding of the structures controlling transport in geophysical flows such as ocean currents. New results show that AUV/ASV motion planning and adaptive sampling strategies are improved by incorporating models of ocean current dynamics. However, these currents change continually and apparently unpredictably, and this makes it highly challenging to take full advantage. The goals of this project are to better understand the dynamics of the dominant structures in ocean currents, and to explore their impact on AUV/ASV autonomy. Additionally, this work will produce robust motion control strategies for both single vehicles and teams of vehicles, to track desired structure boundaries, while leveraging the environmental dynamics to prolong operational lifespan. In pursuit of the project goals, the research objectives are to: 1) identify and evaluate key kinematic features that control transport in oceanic surface flows of greatest relevance to autonomous vehicle navigation and control, 2) develop a general mathematical and control framework for teams of autonomous vehicles that leverages key transport controlling features in oceanic flows for improved navigation and monitoring of dynamic and uncertain environments, and 3) apply the control framework to the tracking of salt wedge fronts using the WHOI Jetyaks to establish the transition from the laboratory to the ocean. This work has a significant experimental component that leverages the PIs' existing research infrastructure. 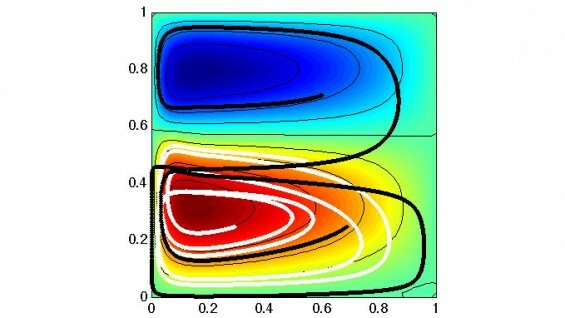 The work addresses the theoretical and experimental challenges needed to develop a general mathematical and control framework for applying geophysical fluid dynamics to the development of novel planning, navigation, and control strategies for individual and networked teams of autonomous vehicles.